Travelling in and out of Karmaling Gewog in Lhamoi Dzingkha Dungkhag is a risky affair during monsoon. The gewog’s farm road is in dire need of maintenance. Locals say the road has not been repaired even once since its construction in the 1980s. During monsoon, the road either gets blocked or washed away by slides. An even bigger threat comes from the rain-fed streams along the way. There are no bridges over the streams. 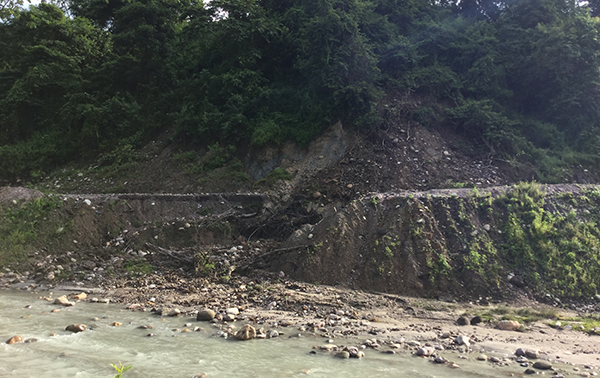 “The river volume increases, making it risky and impossible for us to cross over,” Suk Bdr Limbu, a Bolero driver from the gewog, said. It’s particularly hard when they have to take sick people to the dungkhag hospital. The people in the gewog say more often than not they have to take the sick back after failed attempts to cross over to the other side. 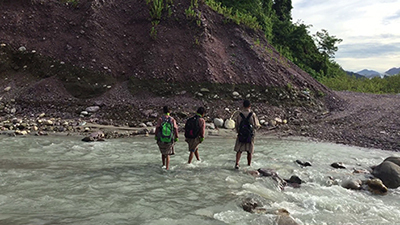 “With no bridges over the streams, we have no choice but to wait for the water level to subside no matter how sick we are,” Dal Bahadur, a local resident, said. For the students, it is a daily struggle. On the days when the river is too big to wade through, they are compelled to stay home. “My father helps me cross over but sometimes the water level rises drastically, preventing us from going to school,” Jasudha Pradhan said. Karmaling Gup Gyan Bdr. Subba says the issue has been discussed in every gewog and dzongkhag meetings. “The government said roads and bridges will be built when the works on the Sunkosh hydropower project commence,” the Gup said. But with the project not having started yet, the Gup said the plan now is to discuss with the Department of Roads (DoR) about the feasibility of constructing temporary bridges over the streams. But the people say motorable bridges would serve a better purpose since they have no other way to get in or out of their villages. Karmaling Gewog is some 18 kilometres away from Lhamoi Dzingkha Dungkhag and home to more than 3,000 people.